A 24-year-old and a 70-year-old are two of the cyclists heading to the Gulf at the end of the month, taking on a gruelling challenge in aid of kidney disease patients. If they complete the 2,000-kilometre challenge that some 25 cyclists have signed up for, Christina Cefai and Godwin Falzon will be the youngest woman and eldest man, respectively, to finish the Foster Clark LifeCycle Challenge 2018. For Christina, this will be her first time taking part in the challenge, after three years being part of the back-up team for the LifeCycle cyclists. She started training last May and is looking forward to the challenge: the thought of making the life of renal unit patients a little bit better will help her pedal from Abu Dhabi to Salalah (Oman). 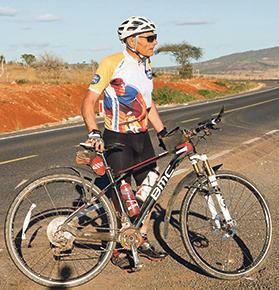 Meanwhile, Mr Falzon took up cycling at the age of 57, after being challenged to pedal to Ċirkewwa by his opponent in a squash game who had just lost the match. Mr Falzon had never cycled before, but when challenged he started training for the feat and biked it from Birkirkara to Ċirkewwa and back. He has never looked back. This will be the third time that Mr Falzon, now 70, has taken part in the LifeCycle Challenge. Together with William Saliba, who is a few years his junior and has completed the challenge more than 10 times, Mr Falzon is the eldest participant. He too keeps in mind the kidney disease patients of all ages, whose lives are changed completely by the ailment. Mr Falzon noted that this year’s LifeCycle Challenge is quite tough and includes travelling through the desert. It would take some nine to 10 hours to complete 200 kilometres, which is the distance they will be covering every day during the event. However, he noted that training for the challenge actually helps him release stress and believes cycling allows him to manage better his work-life balance. Funds raised by LifeCycle since 1999 have been funnelled towards the needs and care of kidney disease patients. If Godwin completes the 2,000-kilometre challenge, he will be the eldest man to finish the Foster Clark LifeCycle Challenge 2018. This year, the challenge aims to raise €150,000 to sustain its current and new projects for the coming year, which will include psychological support to the patients. Apart from life-saving equipment and improved facilities, LifeCycle sponsors the Twilight Shift Van to transport patients to and from Mater Dei Hospital for their evening dialysis, as well as the software matching programme called Traccia which determines the best recipient for a kidney donation. LifeCycle Foundation, meanwhile, partly sponsors the annual trip to Lourdes for patients and accompanying medical staff, and since 2014, it has also funded research into kidney disease. For more information about LifeCycle Foundation and Foster Clark LifeCycle Challenge 2018, visit www.lifecyclechallenge.com. Donations by SMS can be made on 5061 7370 (€2.33), 5061 8920 (€6.99), 5061 9229 (€11.65), or by calling on 5160 2020 (€10.00), 5170 2005 (€15.00) or 5180 2006 (€25.00).